The telltale signs of an economic recovery in Southeast Europe (SEE) were visible in both the top- and bottom-lines of the companies in the SEE TOP 100 ranking. The total revenue of the biggest companies in SEE increased by 15% year-on-year to 87.4 billion euro in 2010 after shrinking by 14% in 2009. The combined net profit of the top 100 firms jumped by 105% on the year to 2.3 billion euro in 2010, driven by the pursuit of costefficiency and the cautious spending mood among companies of all sectors. Despite the positive signs, the performance of SEE businesses in 2010 was far from their pre-crisis levels. In 2008 the companies in the SEE TOP 100 ranking boasted a combined revenue of 95.7 billion euro and a net profit of 3.048 billion euro. A lot of businesses fell into a slump in 2009 in the wake of the global economic meltdown. Eighty companies in the SEE TOP 100 ranking recorded growth in total revenue in 2010 compared to 2009, while 74 of all entrants ended the year in the black versus 71 a year earlier. The improvement of the companies’ financial health reflects the overall recovery of the SEE economies. According to the International Monetary Fund, five out of the seven countries represented in SEE TOP 100 recorded a positive annual growth in gross domestic product (GDP) in 2010 with Croatia and Romania as the only economies to experience a contraction. GDP growth rates were much more modest, between 0.2% and 1.8%, compared to the results of the SEE TOP 100 companies. In contrast, in 2009 the GDP of all countries displayed negative growth values. The first five companies in the SEE TOP 100 ranking retained their leading positions from last year with Romanian oil and gas group OMV Petrom remaining the unchallenged number one, followed by Croatian oil and gas group INA, Bulgarian oil refinery LUKOIL Neftochim Burgas, Romania car manufacturer Dacia and Slovenian energy company Petrol. OMV Petrom ended the year with a total revenue of 3.627 billion euro, up by 8.5% year-on-year. Net profit came in at 420 million euro, up by almost 30% on the year. OMV Petrom has said this result was due to favourable crude oil prices and the completion of a series of strategic projects. OMV Petrom, in which the Romanian government still owns 20.64% after recently failing to sell half of its stake, ended the first half of 2011 with a consolidated growth in revenue of 23% year-on-year to 10.271 billion lei (2.426 billion euro) after benefiting from increased production levels and resurgent fuel and gas demand. Croatia’s INA kept its second place in the ranking of the biggest companies in SEE, reporting an annual growth of 23.14% in total revenue to 3.291 billion euro in 2010. The company turned to a net profit of 239.3 million euro in 2010 from a net loss of 86.4 million euro a year earlier, mainly as a result of increased hydrocarbon production from North Adriatic offshore fields and Syria. Bulgaria’s LUKOIL Neftochim Burgas was in a good position to grow its revenue by 29% year-on-year to 2.794 billion euro in 2010, slashing its net loss by one third to 61.6 million euro. Bulgaria’s only refinery covers about 80% of the domestic motor fuel demand and exports about a third of its output, making it one of the country’s major exporters. Renault-owned Dacia kept its fourth position in the SEE TOP 100 ranking with a total revenue of 2.709 billion euro in 2010, up by 27.81% year-on-year, on the back of a 12% growth in worldwide car sales. 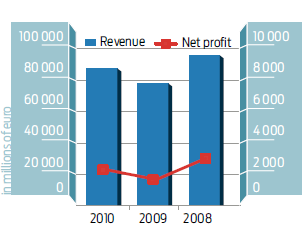 Net profit came in at 70 million euro. Outside Romania, Dacia has production units in seven countries, including Morocco, Russia and Colombia. Slovenia’s Petrol took fifth place with a total revenue of 2.482 billion euro, up by nearly 20%. The group sold 2.35 million tonnes of oil products in 2010, up 5.0% from the previous year. The sixth and seventh spots in SEE TOP 100 went to Romania’s Rompetrol Rafinare, the oil refining unit of Dutchbased Rompetrol Group, which climbed two positions, and the Bulgarian unit of Hamburg-based copper producer Aurubis, which gained seven places. The copper smelter, based in Pirdop, in western Bulgaria, reported a total revenue of 1.952 billion euro in 2010, up by 43% from the previous year on the back of rising copper prices and improving demand. 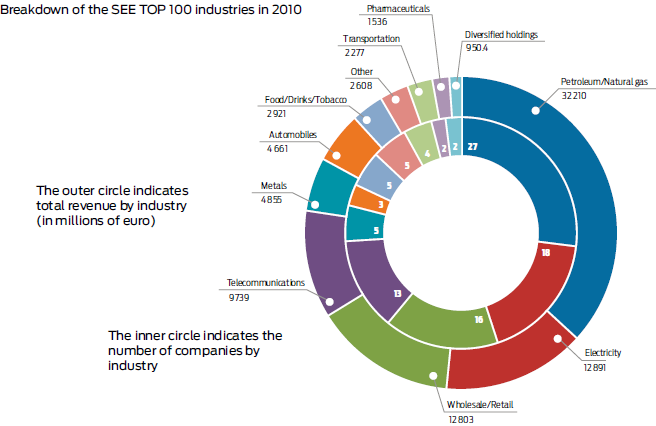 Companies from 15 industries were represented in the SEE TOP 100 ranking for 2010, with the oil and gas sector unsurprisingly holding a significant lead with a collective revenue of 32.2 billion euro, up by 25%, and a total of 27 entrants, three more compared to last year. The companies operating in the oil and gas sector turned to a combined net profit of 855.7 million euro last year from a combined loss of 156.3 million euro in 2009. According to industry officials, last year’s performance was helped by higher oil prices, cost cuts and improved operational efficiency. Eighteen companies operating in SEE’s second biggest industry, the electricity sector, entered the 2010 edition of the SEE TOP 100 ranking, followed by the wholesale/retail and telecommunications sectors with 16 and 13 representatives, respectively. The metals and food/drinks/tobacco industries had five companies in SEE TOP 100 each, closely followed by the transportation and motor vehicle sectors. Southeast Europe’s most populous country, Romania, not only continued to prevail in the SEE TOP 100 ranking but also strengthened its presence in the 2010 edition where it had 47 entrants, six more than a year earlier. The combined revenue of the largest companies in Romania stood at 40 billion euro or 46% of the total revenue of all SEE TOP 100 companies. Bulgaria came in second with 14 companies in 2010, down from 16 a year earlier. The third spot is shared by Croatia and Slovenia,each with 13 representatives, followed by Serbia with 11, and Macedonia and Bosnia and Herzegovina, each with one company. Albania, Kosovo, Moldova and Montenegro were once again shut out of the SEE TOP 100 ranking. The new entries in the SEE TOP 100 ranking were altogether 16, including no less than 11 companies from Romania. The average revenue growth of the newcomers was just over 80% year-on-year and the biggest growth rates were registered by companies in the oil and gas sector, up to 250% in the case of Romania’s OMV Petrom Gas. Seventeen companies in SEE TOP 100 advanced by five or more spots in the revenue ranking and 11 of them climbed by 10 or more positions in 2010 compared to 2009. Among the biggest advancers are Croatia’s Hrvatski Telekom (up to 20th from 35th) which merged its mobile and fixed line operations in 2010, Romania’s OMV Petrom Marketing (up to 22nd from 73rd), steel producer U.S. Steel Serbia (up to 32nd from 52nd), Hungarian-owned MOL Romania Petroleum Products (up to 48th from 70th) and Romanian aluminium producer Alro (up to 70th from 92nd).